We start the week with an achievement assembly, celebrating the success of the children's work last week. The winning class will also spin the attendance wheel. Foundation Valentines Day - Children in Foundation are invited to come in something red, white or pink. They can also come in non-uniform if they wish. Year 1 Trip to Emergency Services Museum - Year 1 are visiting the Emergency Services Museum in Sheffield. Please make sure that your child has a packed lunch and a drink. They will be leaving and arriving back within normal school hours. If you have any questions, please ask any member of the Year 1 team. 6P Class Assembly - 6P will be showing off all the learning that they have been doing recently in their class assembly. This will start at 10.10am in the main hall. Please enter school through the main office. Valentine's Disco - We are celebrating Valentine's Day with 3 separate discos. Each disco will last around an hour. Tickets can be purchased from the main office for £1 each. Discos are only for pupils of Bentley High Street Primary School. 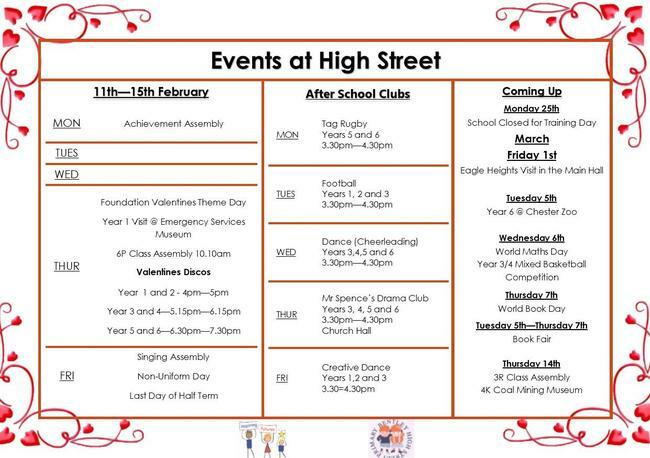 Due to the Valentine's Discos, Gymnastics Extended School Club will not be going ahead. We will be ending this half term with a non-uniform day. Children are invited to come in non-uniform. School will close for February Half Term at 3.30pm. Please be aware that school will be closed on Monday 25th February as it is a Training Day. 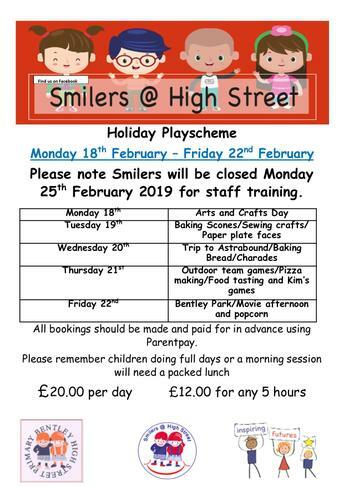 This training day will also include SMILERS staff, so SMILERS will also be closed on this day.